I left with a neat stack of edited and critiqued manuscripts. In my defense, it’s been a busy month. But, thanks to multiple emails and Facebook messages (you can just comment here), I have not forgotten that I promised a Borderlands Bootcamp summary. As a disclaimer, this post has not been edited yet. Read my original post on BBc here. The adjectives that come to mind for most of the weekend may seem negative, but I don’t see them in that light. Grueling, taxing, and exhausting are all mixed up with exhilarating, electrifying and essential. The experience has effected me in deep ways I don’t understand yet. I feel like my core was made up of Teutonic plates that were fused together, immovable, until my Bootcamp weekend. There, everything was not only questioned, but illuminated. My inner plates are shaken and have begun to fashion themselves into new continents. I have no more control over them than the movements of the earth beneath my feet. And now comes the voice I was told I would hear forever after, referred to in BBc as the “Homunculus” of the instructors. Together, they are one creature, voices merging into a cacophony of POV, adverb usage, passive voice! Pity me as the act of reading for pleasure has been stripped from me. I was robbed, and I asked for it. Thank you Enterprise in Gladstone, MO for saving my trip! …to Enterprise Car Rental across the street. I rented a new car, carried my few bags and giant stack of edits to their office where everything was sorted with a smile and it was $20 cheaper. Within a half hour I was on my way. As I drove past the Budget Rental Car office, I noticed they were still empty while the Enterprise office was busy. Karma isn’t really that mysterious. Ahead of me was an 18 hour driving marathon. I had a cooler of snacks and coffees. The drive was uneventful except for seeing a shooting star somewhere in Illinois and an adventure with a coyote who has ninja skills. Ninja Coyote ran in front of my car first and I barely missed him. In my passenger side window I saw him slide to a halt, nose skimming the side of the semi truck that was next to me, before spinning on all four feet to dart back between my bumper and the car behind me to the median. He made it. Mr. Smith was on the phone with me at the time, but apparently all I said at the time was “No, no, no, no, NO! Holy crap, oh my God… holy crap I can’t believe he did that!” This was followed by a lot of “Thank you, God and everyone that I didn’t just become a coyote killer” and “Holy crap, I can’t even tell you what just happened.” Wherever you are now, Ninja Coyote, you have my respect and wishes for a long life. …which was the correct choice. I sat in the back row as a precaution, but I probably didn’t even need to caffeinate to stay awake. The discussion was riveting. Things I didn’t even know were a thing were hauled into the light, examined and then judged. Wandering Points of View, Weak Sentence Structure and Grammatical Atrocities were lined up at the front of the room and shot without emotion. Poor things didn’t even get a blindfold or last words. At BBc, badly written words are last words. If I hadn’t snapped this photo, I’d be too tired to remember this. … woke to a flurry of grabbing stacks of paper, hotel keycards, more Starbucks and a pen to rush to the first session. We started pooling together in small groups as we trickled down the halls and elevators until we congealed in our conference room** before splitting into small groups. Ahead of us were the four rooms of terror. In each, we faced our peers and an industry professional as they critiqued our stories mercilessly. They flayed the skin from our work and hung the sticky sheets in the windows so we could each examine every flawed capillary. With our pens we stabbed and prodded each piece before stapling the raw bits back into a body of work that was to be rebound before carried to the next room and ripped apart again. Every now and then we are lucky enough to meet our heroes Peter Straub is one of mine. I got to share critique groups with Peter Straub three of the four times, each of which was significant to me in a personal way. Outside, I was a cool professional (I hope). Inside, my heart was quaking with fan girl adoration and I resisted trying to steal a lock of his hair. In the first room, I gave him my seat when he walked in and took a spot on the floor. After a few minutes I looked up to realize I was sitting at the feet of a master in every sense of the word. Here was a man I had read as a teenager. He is the author of the only book I ever put down because I was too scared to finish it. He was someone I had never met, but because his words connected us, I felt like we had. And now I was a grown woman, and author myself, at his feet. It was a significant moment to me. Then I saw a bit of lint on the cuff of his pants. I got distracted by where it had come from—his home or somewhere here—and started piecing together the history of this thread. And then realized what I was doing and came back to the present moment and my adoration. In the second group, he sat next to me on the couch. I was sitting next to, sharing carbon monoxide, with Peter Straub. Then, as we were all busy ripping apart the stories laid on the table before us, he took out a notebook and started writing. I was watching Peter Straub write! This is a moment I will be relating to my grand kids, I thought. In just a few hours. As preschoolers, so I may have to tell them all again at a later date. I peeked sideways at him, trying to be nosy, but his handwriting is masterfully undecipherable. Then, he wrote a note, nudged me and showed it to me. Outside, I was a cool professional (I hope). Inside, my brain was trying to record every nuance of the moment so I could relive it for eternity. The third group, he sat in a chair to himself. Hopefully I really was playing it like a cool professional and didn’t frighten him away by gaping at him like an obsessive marionette in the other two groups, I thought. I wanted to cry. I didn’t even know I craved such validation. I’ve received compliments on my work, but this was from a hardened professional. She has waded through years of author tears and angst to that moment where we stood together, and she blessed me. There is no greater compliment than one that is true, and truth can only come from those who have been seasoned to wield it. I’ve heard the words before, but this time I believed them. Cordelia Abrams and I explored and abandoned pizzeria before writing our homework stories. I walked back to the Starbucks in a different world. Reality had been shattered and pieced back together in a form I had hoped for. It seemed too good. I had walked the coals and lived. The prompt was the first line from a noteworthy book. I had been given a line from Jack Ketchum’s Girl Next Door. He had just passed away days earlier and I had met him enough to times to feel personal loss. I was tired, overwhelmed and I had an emotional prompt. The only way to survive it, I reasoned, was to go for short. I went up to the room and wrote Pain Relief, and then relieved my own with a few more hours of sleep. The next day passed around me and I remained frozen in the center, too tired to do much more than respond. My emotions had flat-lined. We read the stories. We shared contact details. We said good-bye. Each of us walked away cradling the sheaths of paper that had come with us as our babies and left as our creations. Grand kids, my lovely first daughter and Edgar Allen Poe. From BBc I drove to visit Edgar Allen Poe’s grave on the way to visit my first daughter and her family in Virginia. It was a moment that couldn’t be avoided. I had read Poe before anyone else I could remember. The Tell-Tale Heart was my first valentine. He romanced me with secrets under the floorboards. I fell in love with shadows and intrigue, ghosts and madness. At his headstone, I left him a gift like so many others, and he gave me a gift back. Then I was back in the real world, full of jumping grand kids and laughing. For privacy, I never reveal too many personal details about my family. I have four children, and even though they share me with my books, they are by far my best creations. I have three grand children that are each absolutely adorable, obviously geniuses and all destined for greatness. They are already there. I also have two son-in-laws that I am happy to share my daughters with. Of course they are both smart, funny and kind, or my daughters would not have chosen them. But no more details on the personal events. Then I drove home, through a blizzard in the mountains, hallucinated something at the peak (a snow tornado, angel, mountain spirit?) and arrived home 23 hours later. That trip home is a story by itself…. for another time. I came back with a mess of scarred work, slashed with red pen and ready to be reborn. *This is a white lie. I throw away boring paper, like utility bills after I’ve paid them. I do horde other paper that is interesting. This includes snippets of paper with interesting words scribbled on it, business cards from other writers, notes from other writers that usually have interesting words scribbled on them, fortune cookie slips… and other noteworthy bits. 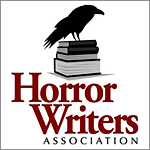 **Horror writers don’t gather, by the way. We congeal. It’s much more descriptive of the sluggishly manic way we tend to group up when together.